Dr. Cohen first became interested in skincare while he was a resident with the world-renowned Long Island Plastic Surgery Group in New York. At that time most plastic surgeons had not yet embraced the benefits of comprehensive skin rejuvenation and maintenance programmes and, most importantly, how this could impact surgical results. He feels the biggest trend in aesthetic medicine is the integration of organic ingredients with high tech treatments that have long-lasting significant benefits. His patients needed treatments that really work and have a lasting effect. Based on this growing trend, he developed a special interest in certain ingredients and their concentrations, and how they positively affected the skin, especially before and after surgery. As an aesthetic plastic surgeon, he is trained to look at the skin in a very complex way. The quality of his patient’s skin is very important in determining what kind of surgical outcome he or she can expect. He limits his recommendations to products that have the appropriate clinical documentation supporting their effectiveness and to those that show proven results in the long run. With that in mind, he formulated the pH ADVANTAGE line of products. What is the pH Advantage? As one can tell from the name of our skin care line, pH plays an important role in determining how effective topical skin care ingredients are in improving one's skin. If you look in all of the beauty shops around the world, you will literally find millions of products on the shelves. The real truth is that you can distill all of these products down to a small percentage of jars that meet the needs of EVERY person. In fact, there are only about two handfuls of clinically proven active ingredients, known to impact human skin quality. All the differences among the myriad of products on the market come down to smell, texture, packaging, concentration of active ingredients, and the pH (or level of acidity) of the active ingredients. So where does bioavailability come in? Let's begin with a basic definition: bioavailability refers to the difference between the amounts of a substance, such as a drug, herb, or chemical, to which a person is exposed VERSUS the actual amount of the substance the body receives. Bioavailability accounts for the difference between exposure and dose. Our skin lives healthily at a pH of around 4. Most soaps are quite alkaline (pH above 7), and should never be used on the face. Common therapeutic skin care treatments include Alpha-Hydroxy acids such as Glycolic, Salicylic, or Lactic acid. When using products such as these to help renew and refresh the skin, the ideal treatment pH is 3.0. So what does this all mean as a consumer? Let's take glycolic acid as a common example. Many glycolic acid products list the concentration or percent of Glycolic Acid in the ingredients on the box. This is only part of the formula determining its bioavailability. 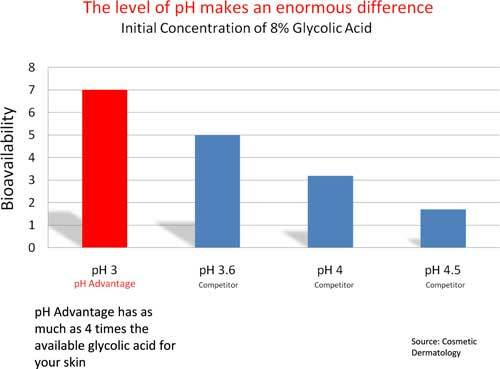 If you compare 3 products, each with a concentration of Glycolic Acid of 10%, and the first has a pH of 5, the second has a pH of 4, and the third has a pH of 3, the one at a 3 pH is 100 times more effective than the one with a pH of 5. The pH scale, like the Decibel and Richter scale is logarithmic. This means that a movement of 1 point represents a tenfold change. Therefore, the same concentration of Glycolic Acid at a ph of 3 is 100 times more bio-available than one at a pH of 5! Knowing the true bioavailability tells the whole story of the skin care's expected efficacy, and why we at pH Advantage provide complete disclosure to our customers. Given that there are so few products which are effective, getting the right bioavailability is crucial. Our products are produced to deliver the APPROPRIATE and MAXIMUM bioavailability of each product we sell. So, an educated consumer is our best patient. Knowing they are getting the best products and ingredients with the correct bioavailability in the end, will effectively serve all of their skin care needs!